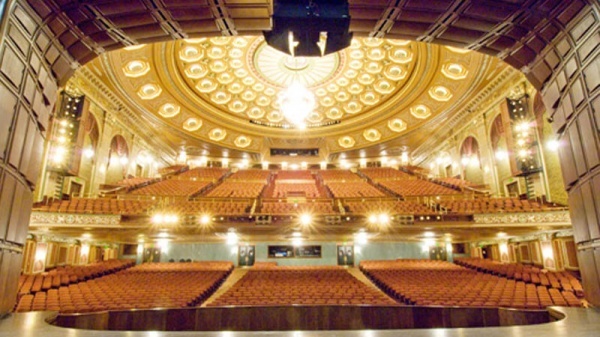 Home of the Pittsburgh Opera, Pittsburgh Ballet Theatre, and Pittsburgh Civic Light Opera, the 2,800-seat Benedum Center is the crown jewel of the Cultural District and is one of the most utilized theaters in the nation today. From the North •Follow Interstate 279 South to Pittsburgh •Take the Veteran's Bridge/ Interstate 579 Exit •Stay in the right lane and take Sixth Avenue Exit •Follow Sixth Avenue and cross over Liberty Avenue •Road becomes Seventh Street •Benedum Center is on the right, on the corner of Liberty and Seventh Street. Or •Follow Interstate 279 South to Pittsburgh •The Fort Duquesne Bridge Exit and stay in the left lane •Take the Fort Duquesne Blvd. Exit off the bridge •Proceed on Fort Duquesne Blvd. to Seventh Street •Make a right on Seventh Street •Proceed through traffic light at Penn Avenue •Benedum Center is on the left, on the corner of Liberty and Seventh Street. From the South •Follow Route 51 North (Saw Mill Run Blvd.) to the Liberty Tunnels •Turn right into the Tunnels and proceed across Liberty Bridge •Take the Interstate 579 Exit onto Crosstown Blvd. •Immediately exit to the left on Seventh Avenue •Follow Seventh Avenue to Liberty Avenue and turn left •Proceed on Liberty Avenue and make a right on Seventh Street •Benedum Center is on the right, on the corner of Liberty and Seventh Street. Or •Follow Route 837 North through Pittsburgh's South Side •At Station Square, turn right on Smithfield Street Bridge •Follow Smithfield Street to Sixth Avenue, turn left •Follow Sixth Avenue and cross over Liberty Avenue •Road becomes Seventh Street •Benedum Center is on the right, on the corner of Liberty and Seventh Street. From the East •From the Turnpike, take exit 6 to Monroeville/Pittsburgh •Take I-376 West (towards Pittsburgh) for 13.5 miles to Exit 1C, Grant Street •At the signal at the end of the exit ramp, turn left onto Fort Pitt Boulevard •Continue another 0.4 miles and at the third signal, turn right, onto Stanwix Street •Proceed straight to the fourth light and bear right (45º angle) onto Liberty Avenue •Go to the third traffic light and turn left onto Seventh Street •Benedum Center is on the right, on the corner of Liberty and Seventh Street. Or •Follow Interstate 376 West to Pittsburgh •Take the Boulevard of the Allies Exit •Take the 579 exit onto Crosstown Blvd. •Immediately exit to the left on Seventh Avenue •Follow Seventh Avenue to Liberty Avenue and turn left •Proceed on Liberty Avenue to Seventh Street •Make a right on Seventh Street •Benedum Center is on right, on the corner of Liberty and Seventh Street. From the West •Follow Interstate 279 North to Pittsburgh •Proceed to Fort Pitt Tunnels •Take Liberty Avenue Exit •Proceed on Liberty Avenue to Seventh Street •Make a left on Seventh Street •Benedum Center is on the right, on the corner of Liberty and Seventh Street. •Benedum Center is on the right, on the corner of Liberty and Seventh Street. •Benedum Center is on the left, on the corner of Liberty and Seventh Street. •Take the Interstate 579 Exit onto Crosstown Blvd. •Take the 579 exit onto Crosstown Blvd. •Benedum Center is on right, on the corner of Liberty and Seventh Street.